Does God Want Us to Be Minimalists? We moved houses this summer, and it proved to be the perfect time to shed unnecessary furniture, clothes, blackened birthday candles and an excess of pool toys. The treacherous folding chair that engulfs anyone under 50 pounds got the boot. I drastically reduced my closet only to the clothes I actually enjoy wearing; imagine that! Extra toys and art supplies were donated, our rusty garage tools experienced the emperors downward thumb. It was such a wonderful purge, a cleansing fire! It produced dramatic feelings; an appreciation for what we use and the desire to care for what was left over. I was a minimalist! But of course, life creeps right back in. As a house handles the daily living, (homework papers, so many soccer balls, the accidental over-purchasing of school supplies) I wonder, have I failed? Guilt creeps in as the “stuff” settles. My house again becomes a place of excess and imperfection. While we still live with less, it doesn’t feel “perfect.” Why is there so much disappointment? Why can’t I feel settled in the dirty day-to-day? When I desire minimalism, do I crave something deeper and more spiritual? I often wonder what God has to say about it all and whether embracing minimalism has actually made me less attached to my possessions. I know that the minimalism trend is a needed response to our culture of excess. Although I have yet to apply the concept to my filing cabinet or the bin of 8th-grade journals I am saving, I do love the idea of only keeping the things in our home that bring us joy and are useful. I think there are godly principles here; we worship a God who values beauty and creation; He spoke this world into life, and by creating a bit of beauty in our homes and choosing things that bring us joy, we are like children mimicking our Creator. On the flip side, the Bible speaks clearly about gathering treasures in heaven. We are to be prudent, wise in our spending and avoid the grip of money while on earth. Having a beautiful space can bring us joy, but if decorating is done without worship in our hearts, our curated spaces will consume us. Here are all sorts of questions I ask myself that help me examine my heart and refocus on Him, His Kingdom and my treasure there. Why, then, do I hang onto stuff? It’s mostly because of the “what ifs.” What if I need that? What if I can use that later? Am I keeping things based on fear of the future? Why am I unhappy in my house? Am I comparing my living space to well-crafted minimalistic magazine covers? Why do I feel like no matter what I do, it is never enough? Do I have jealousy lurking in my heart? Do I feel shame for keeping beautiful things in my house, or for enjoying a space that expresses my creativity? Do I feel guilty for decorating or valuing beauty in my environment? Am I becoming obsessed with the “next purge?” Am I craving the relief that comes with the next donation? Am I constantly thinking of ways to minimize, to the extent that it breeds discontentment with our daily living space? 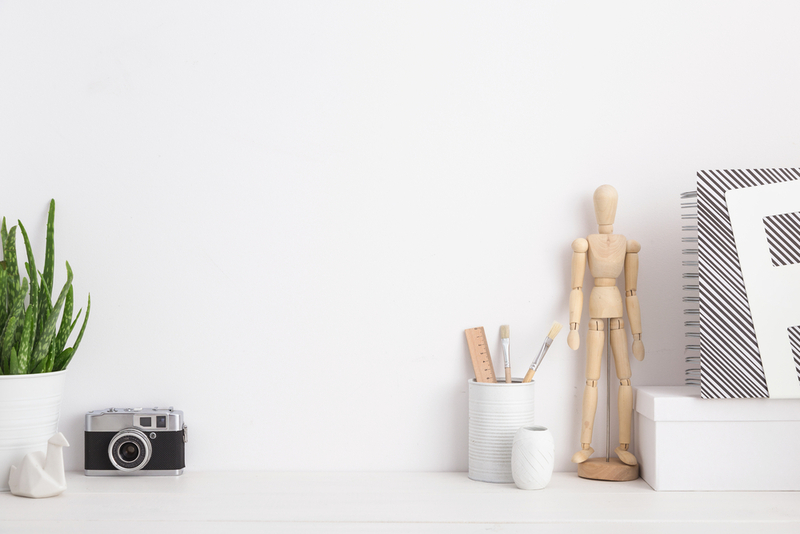 Am I addicted to minimalism, or can I be content with an imperfect space that falls short? Minimalism is sweeping the nation. It pops up in design, in our capsule wardrobes and it helps inform our financial decisions. I really appreciate what minimalism has done for our family; by choosing to live with less, it frees us from the heavy hand of materialism, and frankly, makes house cleaning a lot easier. But as I said, it also opens a can of worms inside my heart – discontentment, comparison, and for me, an almost hyper-awareness of my space. Although I don’t have definitive advice on how to view this popular movement, I think asking these questions is a good place to start. May you find His treasure in neither a clean file cabinet nor the next Instagram-worthy rug, but in creating spaces for your family out of a place of worship and joy, appreciation and reflection of our treasure to come.